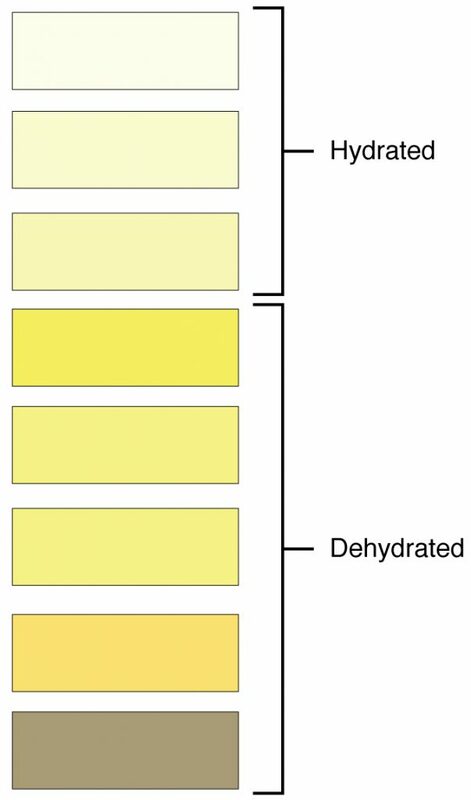 Characteristics of the urine change, depending on influences such as water intake, exercise, environmental temperature, nutrient intake, and other factors . Some of the characteristics such as color and odor are rough descriptors of your state of hydration. For example, if you exercise or work outside, and sweat a great deal, your urine will turn darker and produce a slight odor, even if you drink plenty of water. Athletes are often advised to consume water until their urine is clear. This is good advice; however, it takes time for the kidneys to process body fluids and store it in the bladder. Another way of looking at this is that the quality of the urine produced is an average over the time it takes to make that urine. Producing clear urine may take only a few minutes if you are drinking a lot of water or several hours if you are working outside and not drinking much. Urine volume varies considerably. The normal range is one to two liters per day. The kidneys must produce a minimum urine volume of about 500 mL/day to rid the body of wastes. Output below this level may be caused by severe dehydration or renal disease and is termed oliguria. The virtual absence of urine production is termed anuria. Excessive urine production is polyuria, which may occur in diabetes mellitus when blood glucose levels exceed the filtration capacity of the kidneys and glucose appears in the urine. The osmotic nature of glucose attracts water, leading to increased water loss in the urine. Urine is a fluid of variable composition that requires specialized structures to remove it from the body safely and efficiently. Blood is filtered, and the filtrate is transformed into urine at a relatively constant rate throughout the day. This processed liquid is stored until a convenient time for excretion. 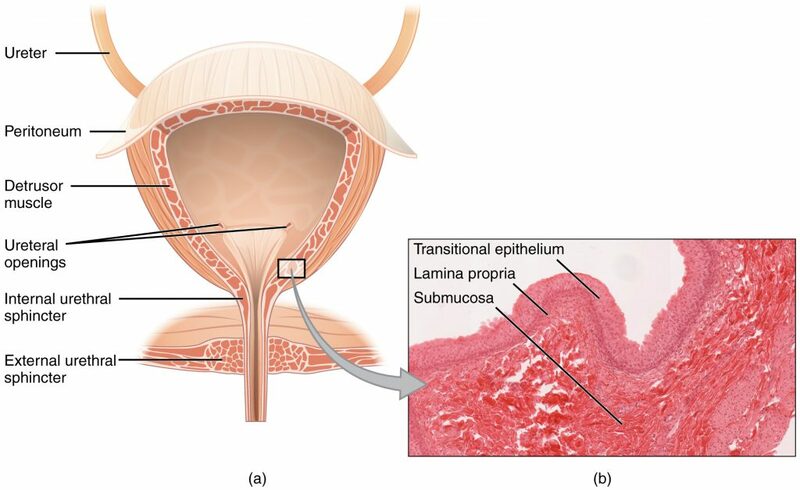 All structures involved in the transport and storage of the urine are large enough to be visible to the naked eye. This transport and storage system not only stores the waste, but it protects the tissues from damage due to the wide range of pH and osmolarity of the urine, prevents infection by foreign organisms, and for the male, provides reproductive functions. 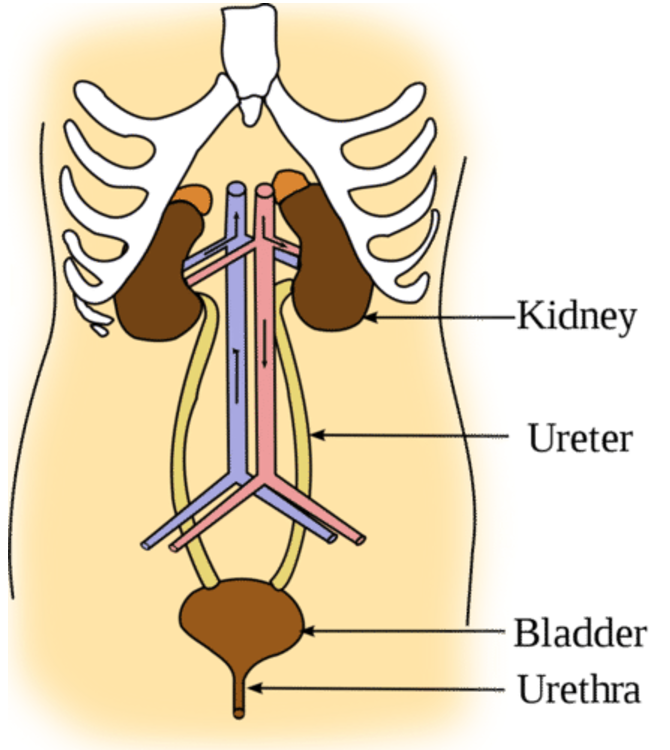 The urinary bladder collects urine from both ureters (Figure 2.21 “Urinary System Location”). The kidneys lie on either side of the spine in the retroperitoneal space behind the main body cavity that contains the intestines. The kidneys are well protected by muscle, fat, and the lower ribs. They are roughly the size of your fist, and the male kidney is typically a bit larger than the female kidney. The kidneys are well vascularized, receiving about 25 percent of the cardiac output at rest. 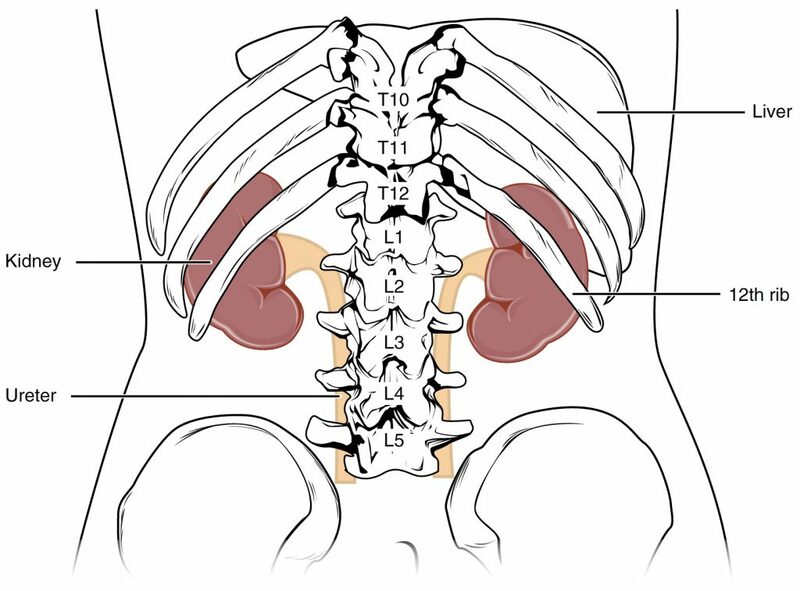 The kidneys (as viewed from the back of the body) are slightly protected by the ribs and are surrounded by fat for protection (not shown). The effects of failure of parts of the urinary system may range from inconvenient (incontinence) to fatal (loss of filtration and many other functions). The kidneys catalyze the final reaction in the synthesis of active vitamin D that in turn helps regulate Ca++. The kidney hormone EPO stimulates erythrocyte development and promotes adequate O2 transport. The kidneys help regulate blood pressure through Na+ and water retention and loss. The kidneys work with the adrenal cortex, lungs, and liver in the renin–angiotensin–aldosterone system to regulate blood pressure. They regulate osmolarity of the blood by regulating both solutes and water. Three electrolytes are more closely regulated than others: Na+, Ca++, and K+. The kidneys share pH regulation with the lungs and plasma buffers, so that proteins can preserve their three-dimensional conformation and thus their function. The Urinary System by University of Hawai’i at Mānoa Food Science and Human Nutrition Program is licensed under a Creative Commons Attribution-NonCommercial-ShareAlike 4.0 International License, except where otherwise noted.